We are pleased to announce the availability of Sandvox 1.6.7, a free update to all registered Sandvox owners. This is a minor but important update that fixes some issues with non-English websites and domains (including a new Writing Direction menu for right-to-left alphabets), along with improvements to RSS feeds, video pages, and the Flickr badge. It also fixes some publishing issues. You will be notified automatically within Sandvox of the new version for instant download when you launch it, or you can download Sandvox 1.6.7 directly here. From time to time, we like to spotlight other interesting applications by Mac developers. When the products from other developers can work with Sandvox, so much the better! This month, we’d like to suggest you check out BannerZest, an application from Aquafadas that allows you to put animated banners and slideshows on your website. 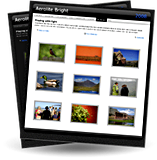 Choose from many different effects: carousels, zoomable image walls, flipping photo stacks, and more. Aquafadas provides instructions on how to integrate their animations into a pagelet and into the banner area (Sandvox Pro edition required). Aquafadas is offering a generous 30% discount off of BannerZest, standard or Pro edition. Just enter the coupon code BannerZest2010 when you check out from their online store. This coupon code is valid through 30 July 2010. This month has been a busy month for several of our designer friends who create add-ons for Sandvox. We have new designs from a long-time Sandvox designer, a new packet from a contributor that’s new to the Sandvox world, and a giveaway of five designs! Jumsoft, makers of several Mac applications as well as digital stationery and templates, has just released a free bundle of five designs that up ‘til now were selling for $12.99 each. Go to the Jumsoft Goodies page and download them while they are free! Blueball Design has a number of updates to announce. They have updated several of their existing designs (choose “Discover Plugins...” from the Sandvox menu to check if yours need updating). A couple of weeks ago, they released Blueball Minimal Colors, a design that contains nine wide design variations, each with a soothing color palette and a great headline font. Blueball is also holding a sale! Through Midnight (EST) July 4, all of Blueball’s designs will be 30% off. Just enter the discount code BlueballSummer30 on their checkout page and update your cart. This discount also applies to their new releases listed here, so don’t delay! Just yesterday, Blueball introduced Blueball First Class, a distinctive design with 6 variations that they describe as being “perfect for family, vacation, & travel blog sites”. We love the title font and the postal theme! If you use the discount code above, this design is a mere $7.00 through July 4th. Finally, we’d like to welcome 11Mystics to the community of Sandvox designers! Their first design for Sandvox is called Aerolite, available in light and dark variations. Be sure to check out the demo pages and mouse around: while these sleek designs are compatible with older browsers, they take advantage of modern browsers like Safari with some elegant transitions, such as when you hover over links or image thumbnails. Plus, it's extremely customizable using Sandvox Pro’s HTML Code Injection if you want — see the demo pages for examples and instructions. Aerolite is an auspicious debut, and we expect many more great designs from 11Mystics in the near future! This is the latest in our newsletter's monthly feature that spotlights a few Sandvox-created websites that we think show off the application’s features well. We hope these examples will provide some inspiration for your own Sandvox site! Muirel and Joshua Sawicki used Sandvox Pro and its built-in “Clean Sheets" design to feature the work of their Phoenix-based Hands on Fire Design Studio. Making clever use of Photo Grids and free-form Rich Text, their Sandvox site seems a perfect fit for their unique eye on visual design and brand identity. Based in Sweden, Bridge to Africa is an NGO that works toward the empowerment of women and to the benefit of vulnerable groups in Africa and those interested in African issues in Sweden and throughout the world. Featuring news and photos about the organization and its projects, Bridge to Africa chose Sandvox Pro and its complimentary “Earth & Sky" design to create a central, attractive, and informative place for their organization on the Web. 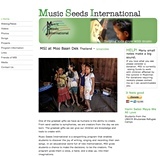 Ross Green and Music Seeds International chose Sandvox Pro to showcase the songs created and produced by kids in their songwriting programs in the remote villages and refugee camps of Nepal and Thailand. Combining a Weblog with Photo Albums and Video pages, this amazing site gives you a unique glimpse into what kids can really do when given the opportunity. Blueball Design’s “White" design was used for its simplicity and clean layout and a PayPal button for donations was easily added via the Raw HTML pagelet feature of Sandvox Pro. Ross tells us that he and the kids originally created this site in Nepal, often by candlelight and battery power, as a way to show the world what they have to offer. As he puts it, “the sense of accomplishment they feel when they open the site and see/hear their creations is one that raises the conscious level of joy in themselves and throughout the world. Thanks for helping make that happen Sandvox." Thank you, Ross, for all that you do!